Astronomers have discovered that two symmetrical jets shooting away from opposite sides of a blossoming star are experiencing a time delay: knots of gas and dust from one jet blast off four-and-a-half years later than identical knots from the other jet. The finding, which required the infrared vision of NASA's Spitzer Space Telescope, is helping astronomers understand how jets are produced around forming stars, including those resembling our sun when it was young. "More studies are needed to determine if other jets have time delays," said Alberto Noriega-Crespo of NASA's Spitzer Science Center at the California Institute of Technology in Pasadena, who is a co-author of the new study to be published in the April 1 issue of Astrophysical Journal Letters. "Now we know that in at least one case, there appears to be a delay, which tells us that some sort of communication may be going on between the jets that takes time to occur." Jets are an active phase in a young star's life. A star begins as a collapsing, roundish cloud of gas and dust. By ejecting supersonic jets of gas, the cloud slows down its spinning. As material falls onto the growing star, it develops a surrounding disk of swirling material and twin jets that shoot off from above and below the disk, like a spinning top. Once the star ignites and shines with starlight, the jets will die off and the disk will thin out. Ultimately, planets may clump together out of material left in the spinning disk. The discovery of the time delay, in the jets called Herbig-Haro 34, has also led the astronomers to narrow in on the size of the zone from which the jets originate. The new Spitzer observations limit this zone to a circle around the young star with a radius of 3 astronomical units. An astronomical unit is the distance between our sun and Earth. This is about 10 times smaller than previous estimates. "Where we stand today on Earth was perhaps once a very violent place where high-velocity gas and dust were ejected from the disk circling around our very young sun," said Alex Raga of the Universidad Nacional Autónoma de México, the first author of the paper. "If so, the formation of planets like Earth depends on how and when this phenomenon ended. Essentially, every star like our own sun has gone through a similar cloud-disk-jets formation process." One of the jets in Herbig-Haro 34 had been studied extensively for years, but the other remained hidden behind a dark cloud. Spitzer's sensitive infrared vision was able to pierce this cloud, revealing the obscured jet in greater detail than ever before. Spitzer images show that the newfound jet is perfectly symmetrical to its twin, with identical knots of ejected material. This symmetry turned out to be key to the discovery of the jets' time delay. By measuring the exact distances from the knots to the star, the astronomy team was able to figure out that, for every knot of material punched out by one jet, a similar knot is shot out in the opposite direction 4.5 years later. This calculation also depended on the speed of the jets, which was known from previous studies by NASA's Hubble Space Telescope. Other symmetrical jets similar to Herbig-Haro 34 have been observed closely before, but it is not clear if they are also experiencing time delays. The astronomers say that some kind of communication is going on between the Herbig-Haro 34 jets, likely carried by sound waves. Knowing the length of the time delay and the speed of sound allowed them to calculate the maximum size of the jet-making zone. 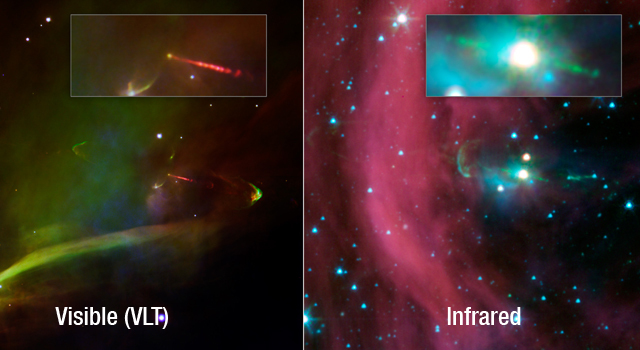 The astronomy team is currently analyzing other jets imaged by Spitzer, looking for more evidence of time delays. NASA's Jet Propulsion Laboratory, Pasadena, Calif., manages the Spitzer Space Telescope mission for NASA's Science Mission Directorate, Washington. Science operations are conducted at the Spitzer Science Center at the California Institute of Technology in Pasadena. 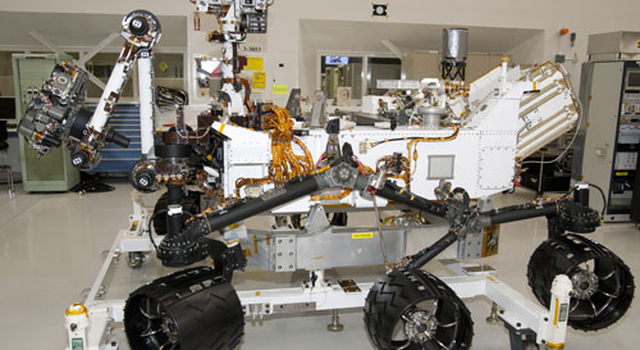 Caltech manages JPL for NASA. 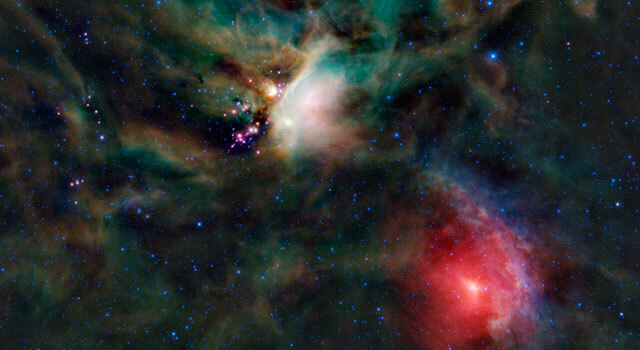 For more information about Spitzer, visit http://spitzer.caltech.edu/ and http://www.nasa.gov/spitzer .